Heat the oil and add the peppers and onions, cook until soft. Add the tomatoes and the rest of the seasonings. Stir to heat through, then add the cooked rice, stir, reduce heat, then cover. Cook for 10-15 minutes (I guess you can go longer too.) Stir frequently. Slice the sausage how you like it (we did it in half, then in 1/4 inch pieces.) and heat over med-high heat until heated through. Assembly. Since we did a spicy sausage and a regular smoked sausage, we served the rice then topped it with the sausage. I also served them with baking powder dropÂ biscuits. Well, it looks as though Spring has sprung here in South Georgia. It’s been in the 70s for a few days now, closing in on 80 a few times. Thankfully, the humidity has not been that high, so it’s not been bad outside at all. 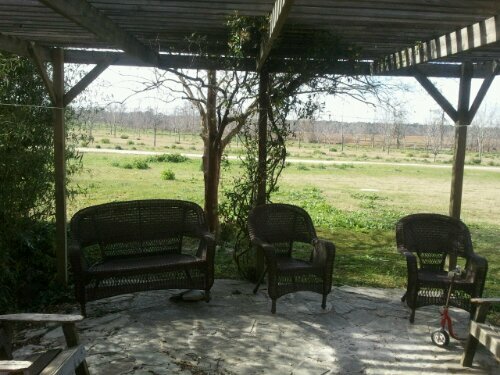 It also helps that the bugs (save for the fire ants) are not out yet! 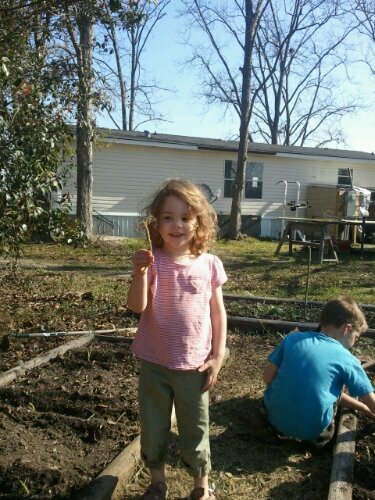 So we started our garden this weekend. 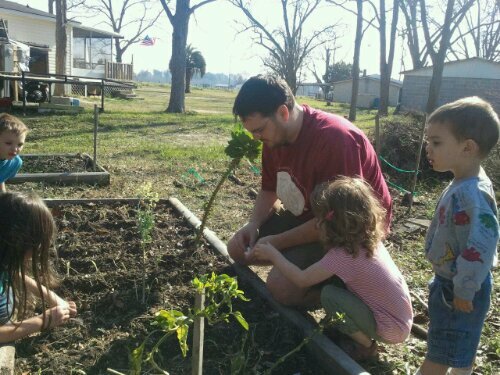 Joshua added soaker hoses to the gardens that we planted today. This will be good for me when the baby comes, so I can just have one of the kids go out and turn them on for an hour or so instead of trying to water while being chews up by bugs and having a brand new baby in the wrap. 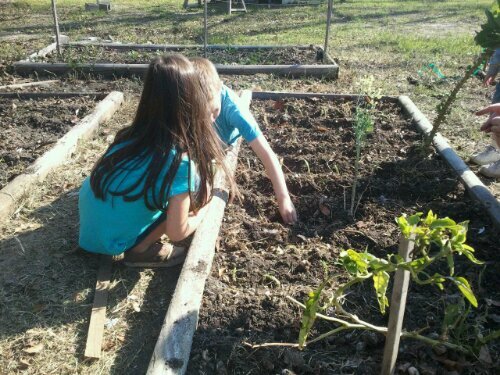 Here are some pictures of the kids planting in our side garden. Benedict did not want to be left out. 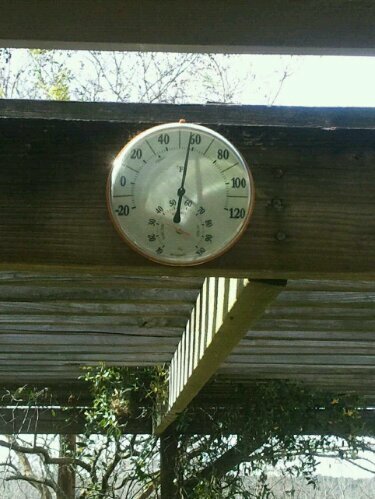 Well, I guess if I am going to live in South Georgia and deal with icky weather for 9 months of the year, I’m going to post pretty pictures of the thermometer and our back patio on days when it is -4 in Detroit. 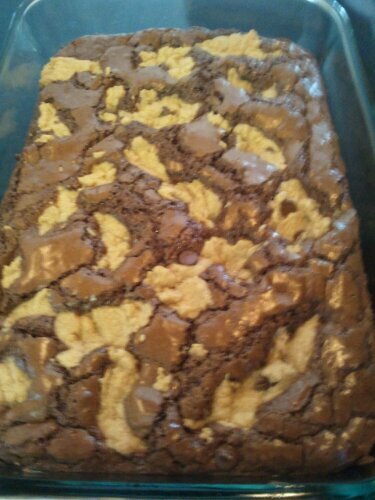 I made these brownies, after letting the recipe sit open on my browser for two weeks. They look good, smell great, and have to wait for 8:00pm for me to cut. Not perfect, but dishes are washed, clutter is mostly put away, and there is dough rising for bread, not bad since I am still exhausted and would like to take a nice long nap! When I was younger my grandmother would make a dinner of pork roast,Â sauerkraut, andÂ kanadles (sp?). TheÂ kanadles were potato dumplings. I’ve been wanting them for a while, but I have a fear of pork (if I is not cooked right I just cannot stomach the taste) so I’ve been holding off on making them. However, I had a pork loin in the freezer and decided to go for it. 1. Place the pork loin in to a roasting pan. Place the sliced onion around the roast. 3. Add a bit of water to the bottom of the pan (I used about 1/4 cup), cover and place in a 350 degree oven and roast for about an hour and a half, or until the internalÂ temperatureÂ reaches 150 degrees. 1. In a saucepan, pour the drippings from the roasting pan (straining out the onions). 2. In a small cup, dissolve the arrowroot in the cool water. Serve the gravy over the meat and dumplings. 1. Peel and cut the potatoes, then place them in a pot with water and set to boil over medium heat. When they are tender, drain, mash, and set them aside to cool. 3. Drop by rounded teaspoons (I used a cookie disher) into boiling water, making sure not to crowd the pan. (I used a huge stock pan I have. so I was able to do this all at once.) Â Let the dumplings cook for about 10 minutes, then remove using a slotted spoon. Place in a bowl and cover until all batches are done or until ready to serve. Melt the bacon fat in a frying pan over medium high heat, whenÂ liquefiedÂ (not hot), add the onions Â and cook until translucent. Â Reduce heat to low, then mix in the sugar, molasses, and Â apple cider vinegar. When sugar is dissolved, Â add cornstarch to thicken. When thickened, add Â green beans and stir to coat. Heat until warmed/cooked as desired. Remove beans with a slotted spoon and place in aÂ servingÂ bowl. Add a little of the glaze as desired to the beans in the serving bowl. Place sauerkraut in the pan with remaining bacon glaze and stir to coat, then heat until warmed. Â Remove to a serving bowl and pour glaze over as desired. I found a bread recipe that I love. Since switching to fresh ground wheat, it’s been a bit of a trial to get bread to turn out well. That was a bit discouraging because I was so used to making bread that we simple and quick and easy, then with the switch, I started making bricks. Bricks as in they went straight to the chickens. I got this recipe from the BreadBecker (out of Atlanta, our source for wheat berries). I haven’t really modified it, but my notes are listed in the directions. * I also have to tell you that I made these for when friends came over for dinner. We had Italian Beef Sandwiches and in the course of eating, it came up that I made the rolls. The husband of the couple looked a bit surprised and said they were really good. Â I admit, I blushed, and really it made me feel good. * I also use the recipe to make cinnamon rolls as well. 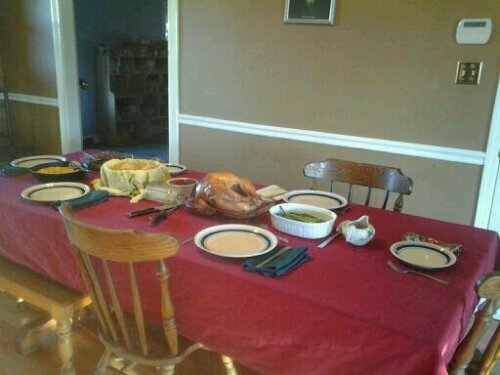 The table set for dinner. 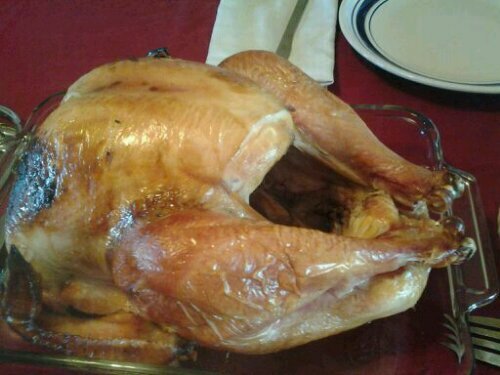 We brined then grilled our turkey this year. I will brine every turkey from here on out! 🙂 It was great. We also grilled our bird last year and loved it, no better way to cook it. Here is an up close of the bird. It looks a bit pale in the picture, but I promise it was nicely roasted. We started grinding our own flour over the summer and some of the things I’ve made have been pretty miss, while some have been really good. Today I struck gold with this recipe for Challah bread/rolls. 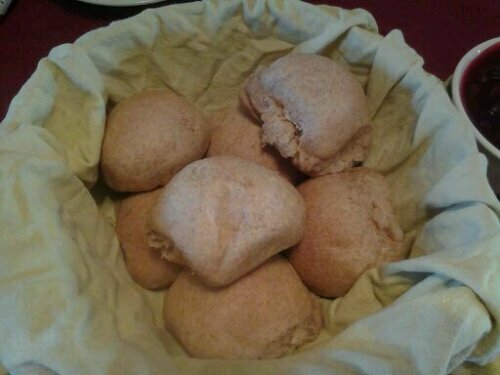 The rolls were soft and moist and well received at the table! Slathered with butter, Â yummy. 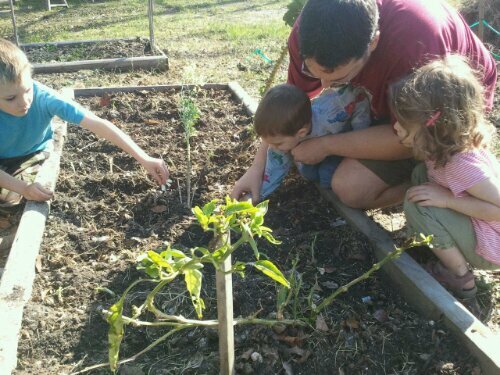 As I mentioned in my last post, we have a bunch of tomatoes in our garden. I plan on canning them and the kids are eating them, whole, like apples, but I am still trying to find different ways to use them, and that means recipe creation in the Facemyer Kitchen. Slice the bread (about 1/4 inch thick) and place on a cookie sheet or the tray of aÂ toasterÂ oven. Smear a little bit of olive oil on the sliced bread. Cut the veggies into bit sizeÂ piecesÂ and arrange on the bread. Sprinkle with a bit of the mozzarella cheese. Butter an 11×7-inch baking dish. Heat oven to 375Â°.Cook the green beans in a small amount of water until just tender. Drain and arrange in the prepared baking dish. 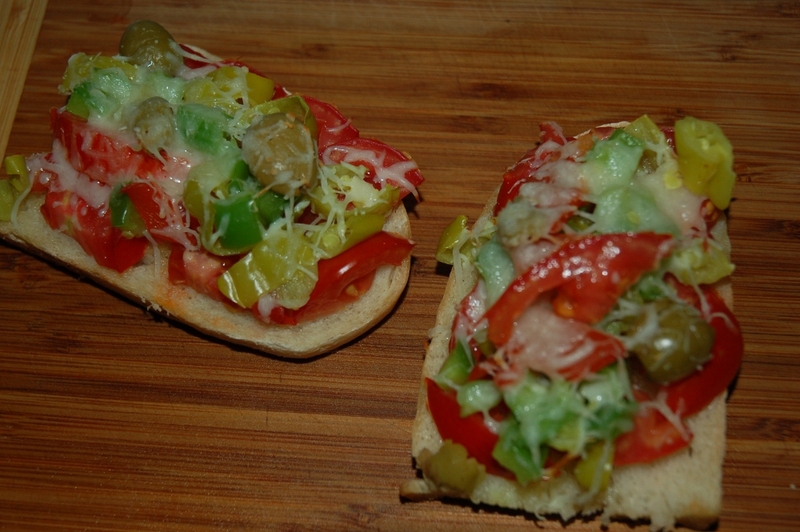 Sprinkle with the diced tomatoes and shredded cheese. Set aside.In a saucepan over medium-low heat, melt butter. Add onion and saute until tender. Stir in flour until well blended. Add the salt, pepper, cream, and sour cream. Heat through, stirring constantly. 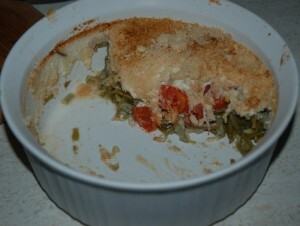 Spread the cream mixture over the green beans then sprinkle the bread crumbs or French fried onions over all. Bake for 25 to 30 minutes, until browned and bubbly. 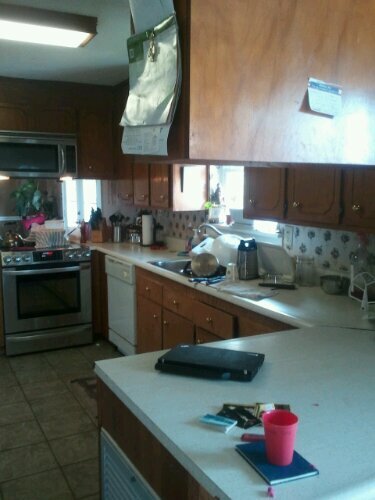 Now let me tell you, Joshua said it looked good when he saw theÂ finishedÂ project sitting on the stove when he got home. He was a bit concerned when he heard what was hidden under the white sauce and cracker crumbs. (to be honest, so was I). When we sat down to dinner a bit later, Â and dug in, we fell in luv. Who knew this combo would be that good? For dinner tonight’s dinner at the Facemyer house we are having oven baked smoked sausage with cabbage and onions, oven roastedÂ potatoes, and peach cobbler for dessert. I love cinnamon rolls. I love almost all things cinnamon, actually. Some mornings I wake up and want a nice cinnamon roll with butter, but don’t have the time to make them before breakfast time, so make due without. I stumbled across the idea of a No Rise Cinnamon Roll a few months ago and let me tell you, these are great! I worked on a recipe of my own, and today I think I perfected it! 1. Grease an 8×8 pan. 1. Â Place butter into a microwaveable bowl and microwave for 30 seconds, to melt the butter. (Keep an eye on it, so that it doesn’t burn, it doesn’t have to be totally melted). 2. Add the sugar and cinnamon to the melted butter, stir. Set aside. 1. Place the flour, baking soda, and salt into a large bowl. Cut the butter into small chunks and add to the bowl. Cut the butter in to the flour mixture until it looks like crumbs. 2. Making a well in the center, place the milk and stir until incorporated. This dough will be very sticky. 3. Turn the dough onto a well floured surface and knead a few times, toÂ incorporateÂ more flour (but don’t over do it). When the dough no longer sticks to your hands or the board, roll it out to be 10-12 inches wide and 15-18 inches long. Make sure that it is not sticking to your board or counter as you roll it out. If it seems to be sticking, lift up and add flour underneath. 4. 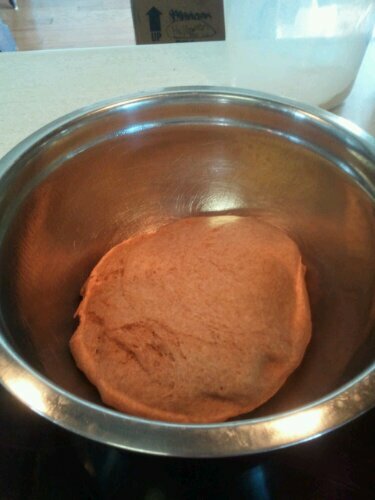 Spread the cinnamon sugar mixture onto rolled out dough, leaving a 1/2 inch margin on one side of the long edge. 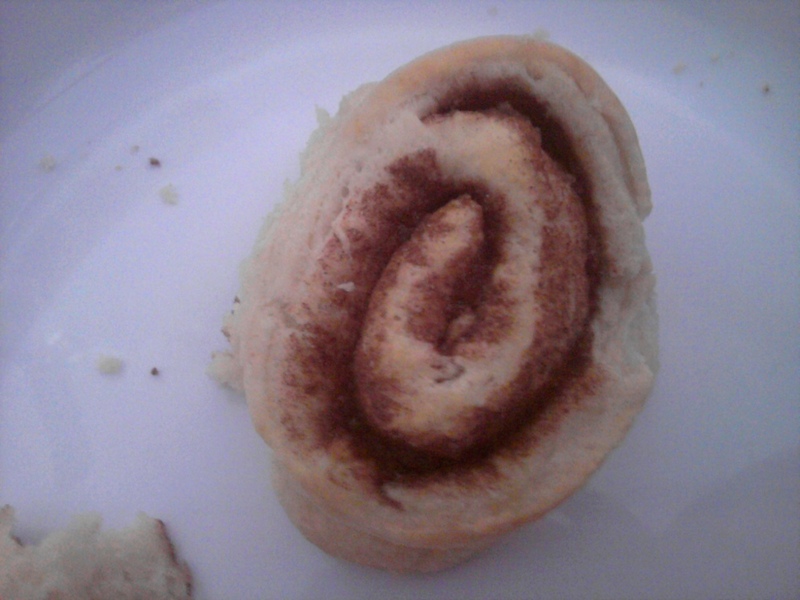 5.Starting with the long end that has the cinnamon mixture on it, slowly roll the dough, in a semi-tight roll. 6. When finished rolling, pinch the seam together and lay seam down. Using a sharp knife or a board scraper, cut into one inchÂ pieces. 7. Place cut side down, side by side, in your greased pan. 8. Bake at 400 degrees for 17 minutes. Serve with butter and coffee.